Click here to browse our list of ferrous and and non-ferrous metals that we pay top dollar for! We have two locations in Southern Illinois. Click here to get directions to both our Hurst IL and Benton IL Recycling Centers. Download our application right here! Our roll-off services are provided for scrap metal only. We have a variety of container sizes to choose from to fit any job that you have. Roll-off containers are a better option for individuals who have a project that is too large for them to haul in on their own. Many businesses find roll-off containers to be more convenient than large semi trailers because they are easier to load and they take up less space. Please contact us for more information. Trailers are a great option for businesses that acquire large amounts of scrap metal and have the equipment to load them. Our trailers range from 4ft to 7ft side open tops and occasionally we have van trailers available. If you have any questions please call us, we will be happy to assist you. Occasionally, we will travel to locations within the tri-state area to disassemble and demolish metal structures. We send our most experienced employees and transport our own equipment to the job site. 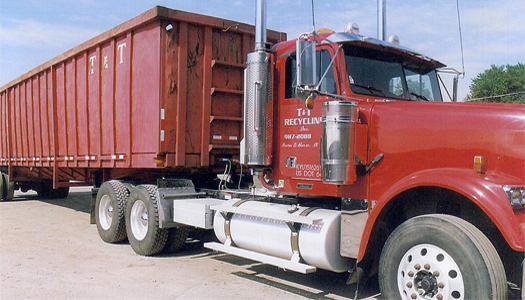 T and T Recycling is a full service metal recycling ccompany serving Southern Illinois with locations in both Hurst and Benton. We service customers in the the Southern Illinois region including: Carbondale, Carterville, Cambria, Desoto, Hurst and Benton.